JEANETTE MANCHESTER HARRIS: Tiles, Tiles, Tiles! You knew there had to be a glitch, didn't you? I mean, the gods just can't let things be perfect, now can they? Otherwise, we'd just get tooooo cocky. One of the witness cones just ever-so-gently leaned over and kissed the edge of a tile. I looked at it and thought, "Right. All I have to do is try to lift that off and the whole tile will give up a hunk of clay." How do you make a replacement for a piece that fits like a jig-saw puzzle? I shiver to think of it. A light tap brought the cone away. The glaze was a tad disturbed, but a bit of grinding will put it right. A running band will be fitted onto a wall to encircle the shower stall. The big hole in shown here in one band is the location of the shower control fitting. In a moment of total paranoia, I made 'spacer tiles' just in case. They are small rectangular tiles the vertical measurement of the band but made in three sets in varying widths of 1/2 inch, 3/4 inch and one inch. They're designed to be inserted next to the door mounts should the frieze band be too short in length. I marked them with my signature stamp and the date. Don't think they will be need though. Next question: How do you mount these kinds of tiles on a vertical wall? Do you start at one side wall and stick them into thin-set holding them up until they 'take' then move on to the next tile hoping the grout allowances will come out okay on the other end? I think I'll try outlining them with a black marker to see how well they'll fit, then use that as a guide. The estimate of the shrinkage came out just fine. Fitted tightly together as it is shown in the photo, the tiles on the narrower walls come out 2 1/4 inches shorter than the wall measurement. The larger wall came out 4 inches smaller. This should allow for grout lines of about 1/4 inch or less between tiles. An interesting side note here: The next time I do this. (Insert derisive snort here) I will make each tile approximately the same size as the next because the larger tiles that go from the top to the bottom of the band, the full width of the design, came out just ever so slightly smaller than the ones that had one cut or more somewhere intersecting the width, therefore calling for more than one groutline and widening the entire width. In other words, if there are to be horizontal cuts in the design, there had better be corresponding horizontal cuts on the next tile and so on, so that the expansion of the width of the sections will be equal. When I mount this set of tiles, I will have to fudge the placement to make up for the space taken up by grout. 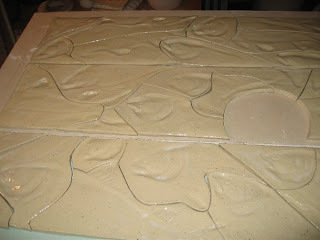 I've decided that the fudge factor will have to be more at the bottom of the frieze than at the top. At the top it would be much more obvious. And, for all of the stuff above, the grout had jolly well be close to the color of the tiles so the fudge factor won't be as obvious. If I ever, ever agree to do this again, please have me committed.